Many companies are considering consolidating or replacing their maturing ERP applications to take advantage of emerging solutions with more intuitive user interfaces, in-application analytics, and mobile access. The move toward ERP in the cloud and a more iterative, less disruptive upgrade cadence that enables companies to gain additional incremental benefit from their ERP investment is shifting customer expectations for all providers. Vendors must show both initial and ongoing incremental benefit through greater usability and functionality to maintain position in the ERP market. 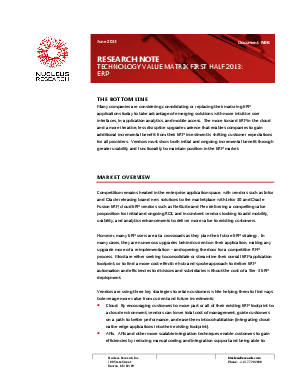 To learn more download this Nucleus Research whitepaper. Compliments of Oracle.